This will show you how the airway is displayed in high ad low zoom settings. 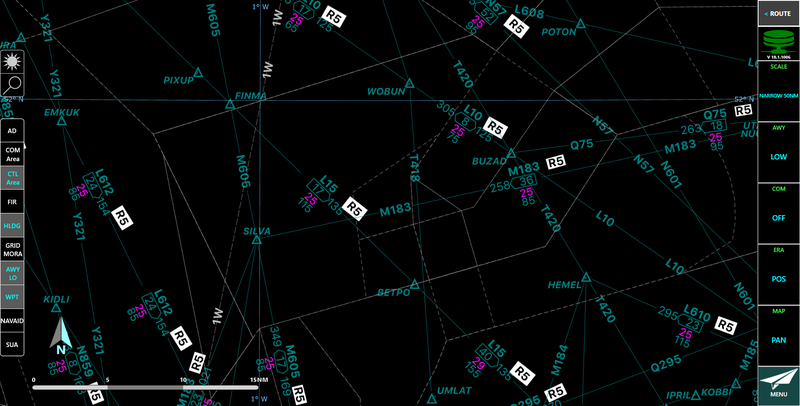 Airways are displayed on the map differently based on high and low settings, zoom levels, the number of airways at a location and their direction. We will have a look how these can be presented and how you can turn high and low features airways on/off. Let's start by looking at the low airways. 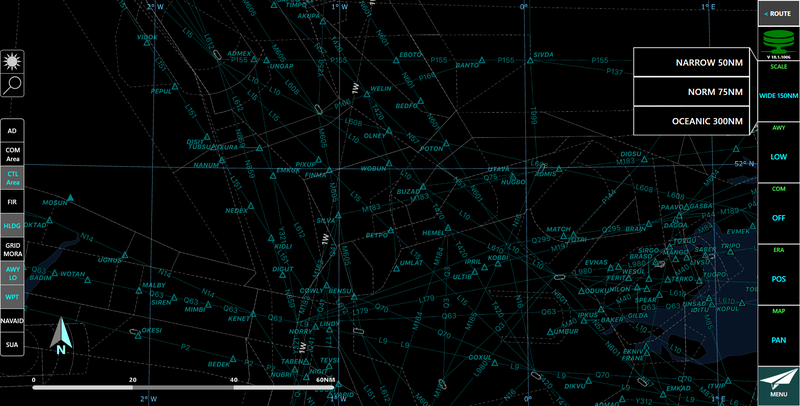 Currently the map is zoomed out where the airways features are not present. 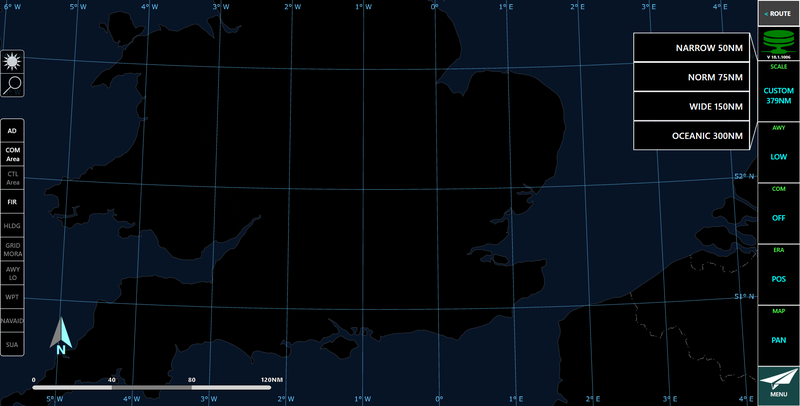 We can see the zoom level that we are currently viewing in, 379NM. Let's change the scale. You can zoom in and out using your mouse wheel as well. If you have the ability and you have a touch screen then you can use the pinch to zoom as well. In this example we will use the scale button on the ribbon tile toolbar. We will start by looking at the furthest zoom level, oceanic 300NM. 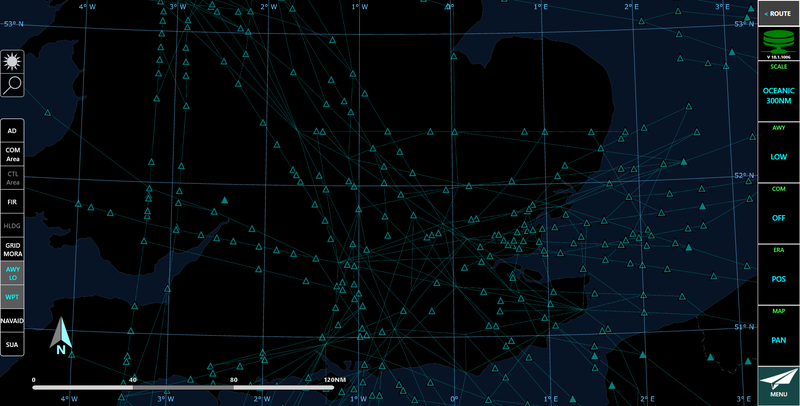 Click the Oceanic 300NM list item. 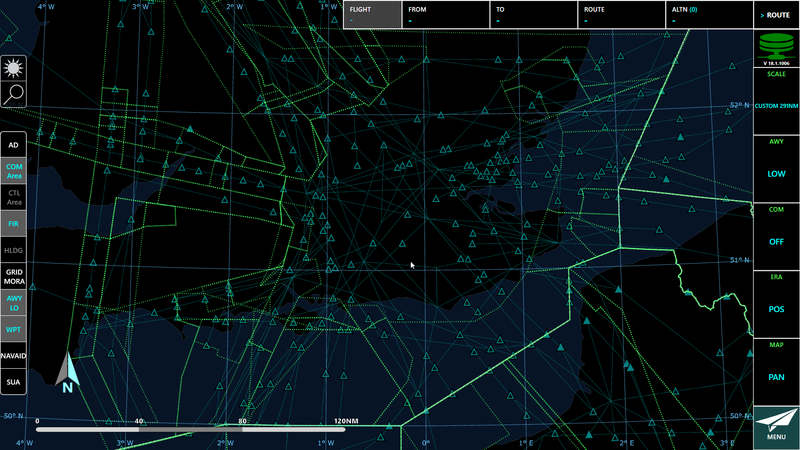 You can now see the airways are visible at this particular zoom level. 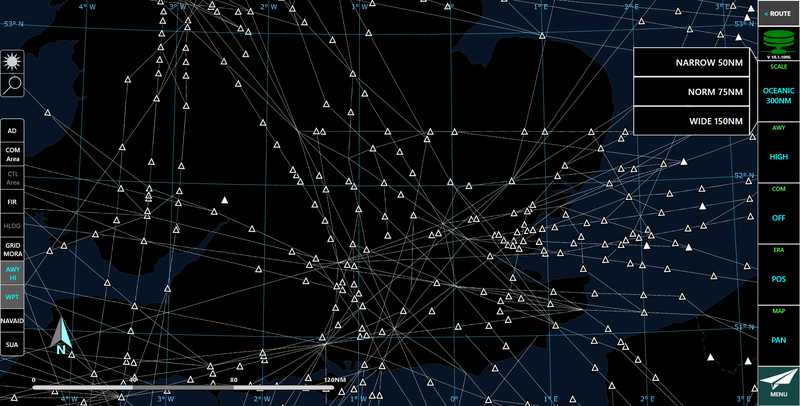 Airways will be shown as lines at this zoom level. Lets zoom in again. Click the Wide 150NM list item. 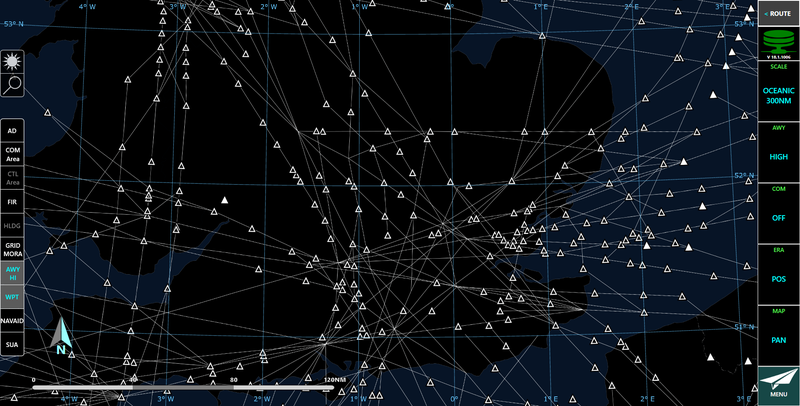 You can now see that the airways have now got names within them only. Let's zoom in again to get a closer look. You can see that some of the airways are presenting you with more information the closer we zoom in. Zooming in even closer to Narrow 50NM we can see the airways details. Remember you can use the mouse to zoom in and out as well as using the scale on the ribbon tile. Let's zoom back to 300NM. Airways from 158 to 316NM are shown as a line and are not displayed above 316NM. You are currently viewing Low airways. These are displayed by a cyan color. 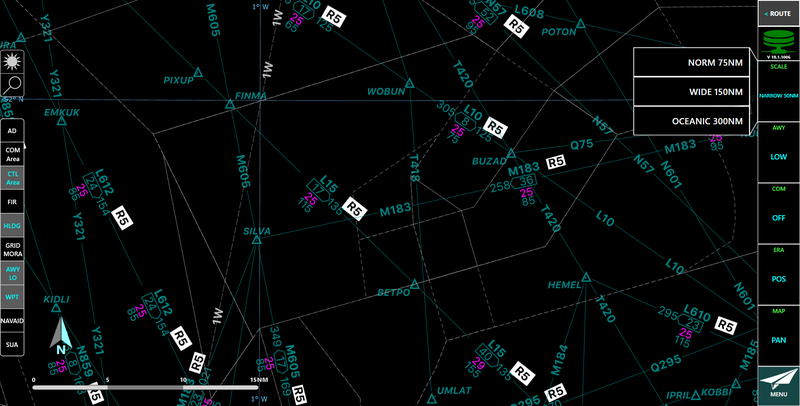 You will also be able to see which airways you are viewing by looking on the ribbon tile. 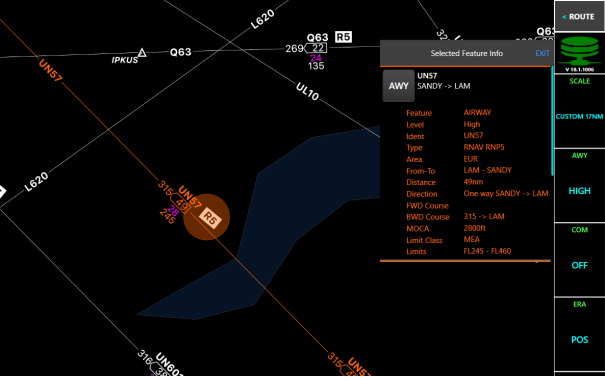 Clicking this feature will allow you to view either ow or high airways. Let's have a look at changing the airways to High. Click the Airway menu item. High airways are shown in white. You can see that the AWY has changed from low to high now. This shows us the airway we are viewing. 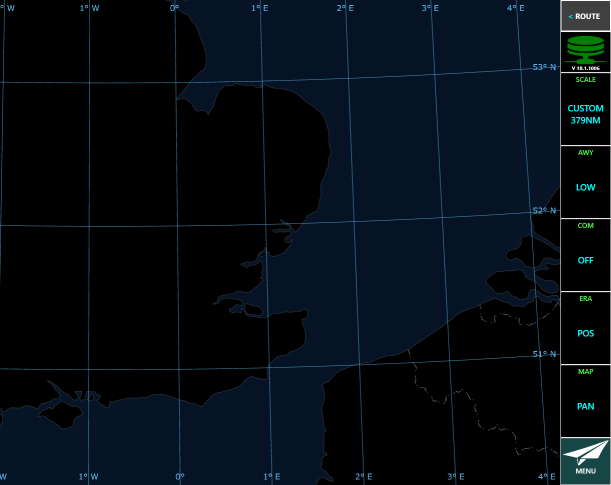 High airways are shown in white in night mode and are shown in black in day mode. Low airways are cyan both in day and night mode. Click the Narrow 50NM list item. Zooming in will present you with more details of the airway. 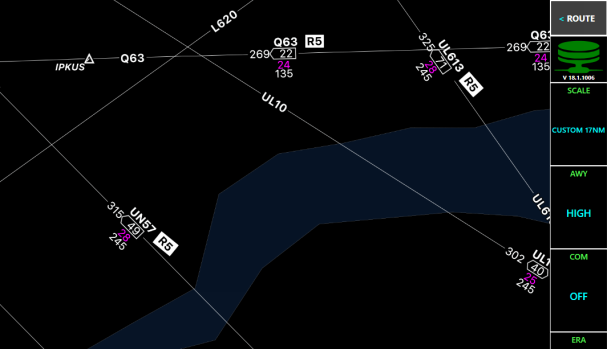 You will be able to clearly see the airway name, distance, course and RNP values (if defined) along with the minimum enroute altitudes. Selecting an airway will give you access to more information regarding that airway. Select the following airway to see more information. Right-click the Airway UN57 image. Selecting the airway will bring up a list of features to choose from. Let's look at the AWY feature. See access map data for more information. Click the AWY list item. You can now see some more detailed information on the airway that you selected. The entire length of the airway will also be highlighted to make it more obvious. 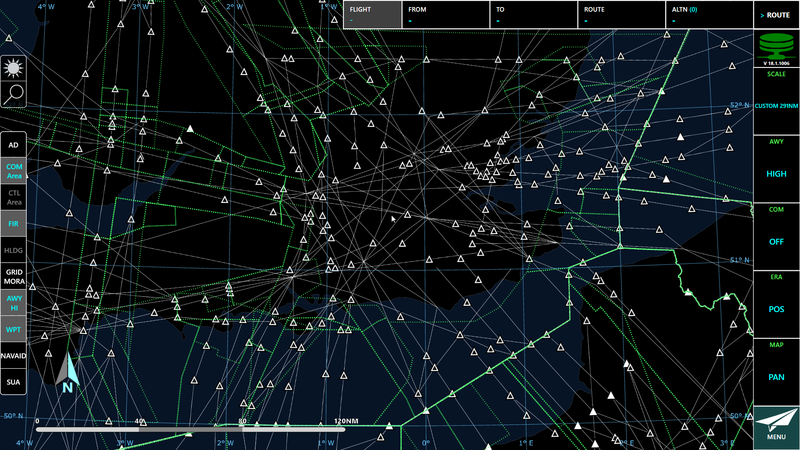 There can be up to 12 airways displayed in one location. 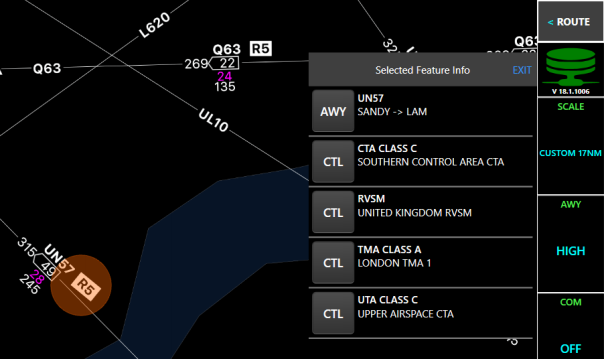 In these instances, it is not possible to show all of the information on the map and airways are either represented as a list of airway names or as a number. 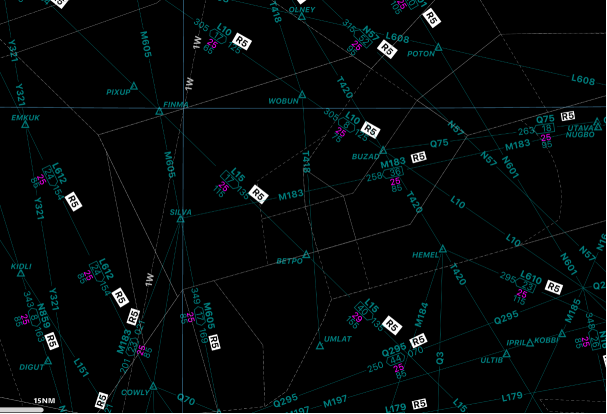 The image below shows 11 airways on the map. In the first image 11 names are shown and in the next the group of airways is represented by the number 11.